It's no secret that I love books by and/or about people of color. If you click on the header of this blog's home page, you'll shuffle through three collections of books based on genre. Of those 18 books, only two were not written by people of color. While my blog focuses heavily on books featuring characters of color, it does not solely. I'm open to reading about all cultures and, hopefully, readers of this blog are too. African Americans are as much a fabric of this country's history as anyone else. So it's ironic that on the 4th of July, a day to celebrate America's independence, Huffington Post would release a list of "50 Books That Every African-American Should Read." Like bookstores and publishers, they continue to get it wrong. I don't necessary agree that every book on this list should have made anyone's list, but I strongly disagree that this list should be limited to African Americans. The result of lists like this is that readers that are not African American can be made to feel as if these books don't apply to them and are specifically for African Americans. This is the same vibe they get from the segregated sections in bookstores that are labeled "African American Lit." Sure they can venture into the section, but does that label really encourage them to? I can honestly say that I've never seen, and I highly doubt that I will see, a list of "50 Books That Every White American Should Read." You know why? Because that list is simply called "the classics" and everyone in America is expected to read them in their high school or college lit classes, regardless of their race or culture. Books by and/or about white America are considered the norm. Why not recognize that some of the books on Huffington Post's list belong on the classics list instead of continuing to segregate through literature? Actions like this are part of the reason why some in white America grumble about things like Black History Month or the NAACP Awards. If mainstream America recognized the contribution of African Americans as American contributions and fully integrated black history into the American history taught in schools instead of relegating it to three paragraphs, and recognized achievements of people of color overall, there would be no need for either. By the same token, don't throw just any old book at me simply because a person of color wrote it. Some of the books on that list had no reason for being there other than the fact that their author was African American. As I read through the comments on Huffington Post, it would seem that most people agree that the title of the list wasn't well thought out, even though its intentions may have been good. 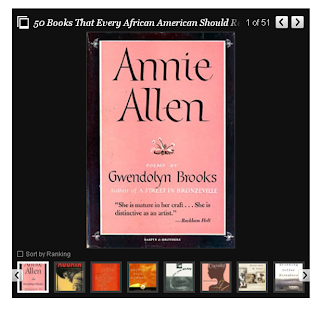 Perhaps the article should have been titled "50 Books by African Americans That Everyone Should Try Reading," because, ultimately, real readers want to read good books regardless of who wrote them.